Cal-Mil 390 Suggestion Box with Cardholder - 7" x 7" x 16"
Securely collect your customer comment cards with this Cal-Mil 390 suggestion box. This locking suggestion box has a front-mounted clear card holder to better organize your comment cards or suggestion slips. Your customers will easily be able to take a comment card right from the front of the box, fill it out, and submit their suggestions for you to take into consideration. This unit includes a lock and two keys to ensure that your customers' comments remain safe and private until you are ready to read them. 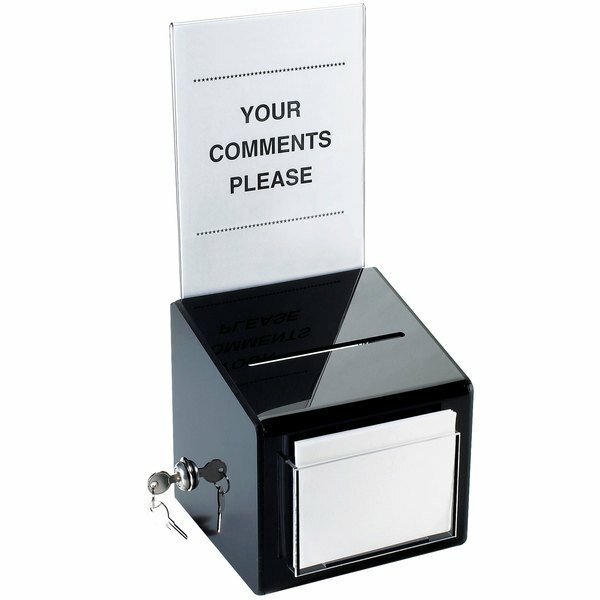 Cal-Mil 388 Wall Mounted Suggestion Box - 12" x 3 1/2" x 15"
Overall User Rating: Cal-Mil 390 Suggestion Box with Cardholder - 7" x 7" x 16"
It's always good to have a suggestion box. You never know what your customers are thinking and it could always help you out in the end. I love what my customers have to say, good or bad. The Cal Mil 390 Suggestion box with Card holder 7" x 7' x 16'. It is great securely locked box, Where you can get your customers suggestions. Well worth the price. Suggestion boxes are great to have in your business. They allow the customers to tell you what they think about you products and how to improve them. What a great way to really find out what your customers want. I always make sure there are slips to make customers feel as important as they are. The Cal Mil 390 Suggestion Box with Card Holders 7"x7"x16" is a great way for our customers to give us privet suggestions on their service and food.They can add tips on different foods theyed like to see on the menue. This is the box youre looking for. Great price, and locks from the back, allows customers to drop off comments on their way out. If your in management then you know how important customer feedback is. This is for you. This item is perfect for a restaurant that wants to listen to its customers! It holds comment cards nicely and makes customer feedback a breeze to collect!